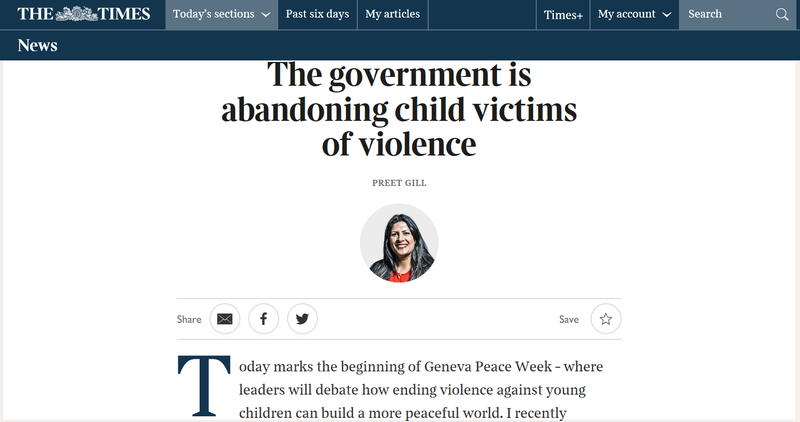 "Today marks the beginning of Geneva Peace Week – where leaders will debate how ending violence against young children can build a more peaceful world. I recently returned from Uganda, where more than a million South Sudanese refugees could tell politicians why that is critical. During that trip, I met Jacob* – a 14-year-old boy from South Sudan. Jacob’s life changed forever when conflict erupted in his village two years ago. His father was killed in front of him, and he doesn’t know where his mum is. So Jacob, at 12 years old, took his four younger brothers and sisters and fled to the Ugandan border to safety. They joined thousands of “unaccompanied children” who have fled from South Sudan without family to look after them. He is one of a staggering 250 million children around the world who live in countries affected by conflict. The number of verified grave violations of children’s rights last year surged to 21,000. These are appalling, almost incomprehensible figures. Extraordinarily, the majority of fragile countries received no humanitarian funding from the UK government to help to end violence against children in 2016. This included the Democratic Republic of Congo, Iraq and Somalia, where serious abuses have been documented. This is the stuff of nightmares but it is desperately real: the recruiting of children aged eight into armed groups; trafficking; sexual and physical exploitation; and children being forced into dangerous work. Theresa May has pledged to end modern slavery and trafficking. But without effective investment, the UK is as good as abandoning such children in these countries to a terrible fate. A new report commissioned by the international aid agency World Vision shows that in 2017, the UK spent only £35 million of its £1.4 billion humanitarian aid budget on projects to end violence against children. In the budget announcement last week, Philip Hammond, the chancellor, again committed to spending 0.7 per cent of national income on overseas aid. But how much of this will be dedicated to humanitarian and fragile contexts and to the children who need it most? The Tories have long been attempting to repurpose, reallocate and redefine aid, diverting money designated for the world’s most vulnerable to plug the budget gaps in other departments created by eight years of austerity. The UK is a leading member of the Global Partnership to End Violence Against Children and signed up to the global goal of ending violence against children by 2030. In 2015, the government said it would prioritise those most at risk of violence in its five-year strategy for UK Aid. Unfortunately it contains glaring gaps, most evident in its strategy and approach to supporting young people who do become victims of abuse. We cannot afford to leave this flawed strategy as it is. We also need to think more broadly and bring in preventative policies to protect children from becoming victims of violence in the first place. I am calling on Penny Mordaunt, the secretary of state for international development, to address violence against children and will be championing this cause in parliament. Ending violence against children should take centre stage in our humanitarian efforts. A Labour government will introduce a shift towards locally led crisis prevention to promote sustainable peace building attempts. A culture shift is desperately needed – child protection is life-saving, as much as food, water and shelter. *Name changed to protect identity"
You can read the original article in The Times here.